HomeBlogUseful TipsStudents: Have Your Own Swipe File! 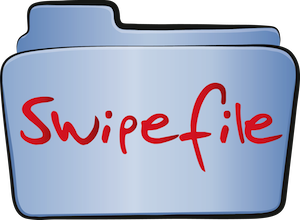 Students: Have Your Own Swipe File! A lot of students do not know what swipe files are, what their purpose is, and how to even make one. Well, it is really very simple; a swipe file is like a diary every writer keeps. This diary includes their previous work, and related things such as reference sites, pictures, important URL or anything that grabs your attention. You can let your imagination run wild. As a student using a swipe file will help keep you organized so you can submit your work on time and at the same time keep all the information you need in one place. Copywriters use swipe files to keep records of their work. They gather and store all needed information so that when needed all information is easily accessible. Students can do the same and benefit from the advantages offered by this simple tool. Creating swipe files takes hardly a minute. There are three ways of doing this. Making swipe files online is very easy, all you have to do is search on Google i.e. www.Tumblr.com is one of the hundreds of places where a user can create their swipe file and easily keep it updated with a click of a button. Artists would prefer a better platform for their work i.e. www.deviantart.com. You can also make a folder on your desktop. Simply create a new folder and you can save anything that appeals to you directly into it. Another option is to drag your important files or documents into the folder – as easy as that. If you decide to make a scrapbook or journal, you can use any empty book and fill it with loads of stuff. You can add clips from newspaper or printouts or you can cut and paste pictures, make it as creative and original as you want to. There are many benefits in containing a swipe file. 1. All work you save will be in one place. 2. You can retrieve any work anytime. 3. If you save your work online it will not be erased and will be stored as long as you wish. 4. You can share your work online with your friends and with the world. 5. Organized files help save time. 6. You can make and save copies of your work. 1. Saving work may not always be easy as lots of times servers are full or the Internet is low. 2. Files from desktops can be erased. 3. Your scrapbook or journal can be misplaced. Students will benefit from making their own swipe files. As mentioned above, it will help save time and efforts. Having all your information organized in one place is very useful in a student’s life as a lot of times they have to meet deadlines. This also becomes a healthy habit. Swipe files are the most efficient way of keeping your work safe and secured and they are easy to access anytime you want to. In short, students should maintain swipe files to gain easy access to their work.